Ark: Survival Evolved is out now so, to celebrate, Studio Wildcard have teamed up the with folks behind some of the fancy effects in Game of Thrones for a new live-action trailer – you can check it out above. Fancy a go? We have 50 codes for Ark: Survival Evolved to give away. The result? A 16-second teaser in which some dude gets eaten by a dinosaur. Apparently, it’s to be continued – although, presumably, with the guy now in the dino’s belly. Ark’s a tough place, buddy. The award-winning team who worked on the teaser includes Game of Thrones’ VFX supervisor, Sven Martin. 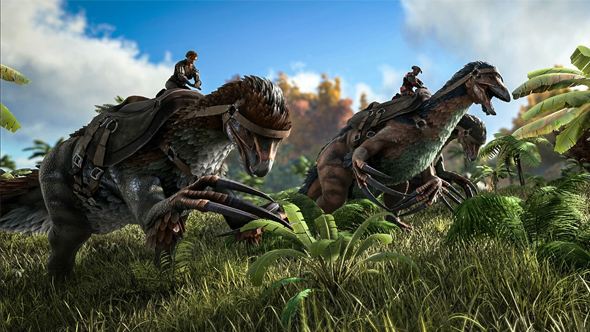 Ark: Survival Evolved is out now on Steam. Despite it only just coming out, developers Studio Wildcard have announced the game’s next major expansion pack: Aberration, which launches on Steam in October this year. If you’re wondering whether to jump in now that the base game is finally out of Early Access, you can check out our review Ark: Survival Evolved review here.